Source: Space Science and Engineering Centre, University of Wisconsin – Madison. www.ssec.wisc.edu/data/paw/ Follow the link to Satellite, Southern Africa, Clouds, Precipitation. The much-anticipated cut-off low never materialised off the Cape Town coast, at least not on the surface, but a very strong low pressure system developed around Wednesday at about 15,000 feet aloft. At the beginning of the week, the approaching South Atlantic high had all the ingredients for a major storm over the Western Cape. 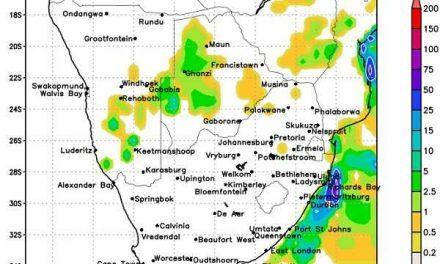 It captured the South Africans’ imagination to such a degree that they even named it in advance – Zinhle – similar to what weather agencies do with tropical storms and cyclones. The expectation was that Zinhle will develop just south-west of Agulhas and then being pushed north-west by the outer rim of the very strong South Atlantic high measuring 1036 mB at its core. This did not exactly materialise although it must be said that the synoptic chart for Thursday was indeed very complex with clear indications of wet and windy conditions, not so much on the peninsula but further inland and to the east. All the activity was in the middle levels between 15,000 and 30,000 feet. This can be seen on the visual where there is a clear cyclonic circulation over Cape Town and upper level frontal conditions covering two thirds of southern Africa. In Namibia, the interaction between the cyclonic and anti-cyclonic systems, had a much bigger impact witnessed by the fairly rapid cooling during a windy Thursday, and the sub-zero temperatures in the Karas region that started as early as midnight. The anci-cyclonic system is the high pressure cell. It is stable, cold and dense. At its core there is almost no movement of air but because the South Atlantic high in particular, is such a powerful animal, the further away from its core, the windier it gets. This generates the south-westerly winds so common along the Namibian coastline. The cyclonic system is just the opposite. 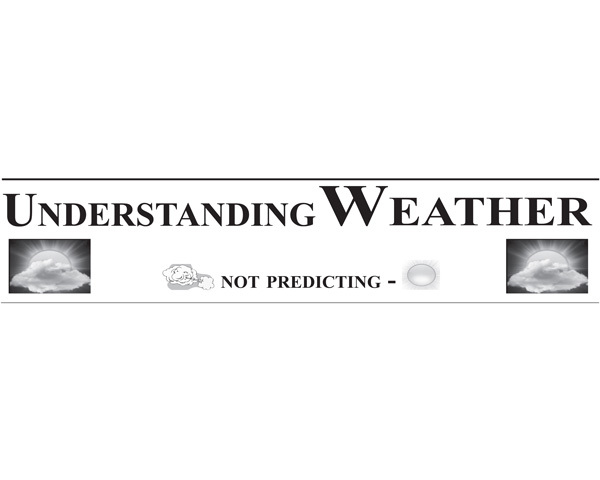 It is by definition a low pressure system and its movement is upward. Where it meets the outer rim of the adjacent high, it literally scoops up the cold air and spills it out in the middle and upper layers from where it can travel far and wide. This is what happened this week. The strong cyclonic circulation over the Western Cape was fed by extremely cold, polar air from the outer rim of the South Atlantic high. This air was convected far north into Namibian airspace leading to the sudden drop in temperature during Thursday and Thursday night. And since the intrusion came at a high elevation, its effect carried deep into the interior. Although it was only the South that experienced sub-zero temperatures (-1 at Aus and -1.8 at Koes) the rest of the country also suffered a fairly cold night. With cold air in the middle layers, it was to be expected that it will tend to sink and this occurred during Friday when local, surface temperatures rapidly improved due to diabatic compression. The mid-level low pressure system rapidly decays as it moves across the South African interior. By Saturday only a weak vestige remains offshore the Eastern Cape so the local influence is nil. The South Atlantic high is pushed along rapidly by a very active jetstream in the alto levels, following a regular winter pattern and settling as the continental high over the South African interior south of the Orange River. 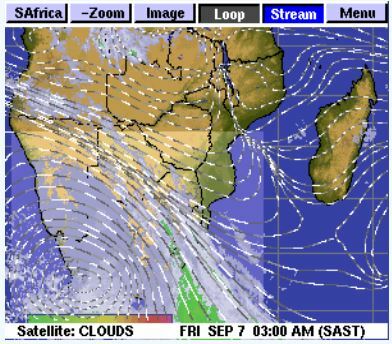 By Saturday morning the cold will come from the east and impact the Kalahari and the Otjozondjupa region along the Botswana border but by Saturday afternoon most of the cold effect over Namibia has disappeared. The high is expected to linger over South Africa for a day with its customary ridging to the north and then spreading backwards late on Sunday. There creates a substantial pressure differential between Botswana and the Namibian coastal plain so one could expect very windy but hot conditions in the central Namib during Sunday night. By Monday the continental high has departed and Namibia returns to pleasant early-spring conditions. After the cold from the east, the windflow backs to north and warmer, moist air should penetrate from the north. There is a decent chance of clouds over the northern half of the country, and the Kavango and Bwabwata may even see some light showers on Tuesday and Wednesday. With the curtain drawing on the winter rain season, conditions in northern Angola, Western Zambia and the southern DRC, are becoming more important and for the next two months, the position of the Inter-Tropical Convergence Zone will be the weather element to watch.